Beautiful Oceanfront Studio Right On The Beach! This beautiful studio is right on the beach - walk right out from your back lanai any time and enjoy the beach and crashing surf! Watch gorgeous sunrises and keep an eye out for sea turtles, whales, and the occasional rare Hawaiian monk seal. Well provisioned to enjoy making your own meals in-house, but great dining options also exist in walking distance only a block away. Centrally located, spend time out exploring the island or curl up with a good book while listening to the soothing sounds of the surf. We stayed in Kapaa 4 for the first time on April 2/2019 through to April 15. It was our first time to the island an was weary as to where we wanted to stay as our trip was planned online and done by ourselves. Not knowing much about the island our goal was to get a ground level close to the waves. The booking was easy and all questions answered prior to securing the dates. Pictures online were very well displayed and matched the actual condo which was refreshing to get exactly what we paid for. Communication was clear and concise with booking agent and instruction and reminders with easy to follow. Upon arrival we landed in Kauai in the dark and it was easy to find with great instructions from airport. We woke to the sound of the waves and a clean/bright surroundings. Easy entry to the place without any hassle to gain access into the condo. We were welcomed with peace and cleanliness of the Kapaa Sands 4 and loved our stay the entire time. The location on the island was perfect. Quiet and quaint it offered easy beach access and privacy which is what we were looking for. The grounds were well looked after and the building, although older, was well maintained and offered a true island vibe. 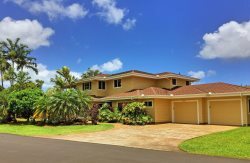 Kapaa Sands was a quiet setting with well respected owners and renters. We loved how is was quiet and off the beaten path of the denser populated resort areas. At the end of every day we loved coming home to our little place in heaven. It will be easy to refer this place to family and friends. We hope to visit Kapaa Sands in the future and make it a regular place to call our little piece of heaven n earth Departure was made easy with exit instruction but found it hard to leave. We look forward to revisiting Kapaa 4 in the future. Nice studio, fully equipped and great ocean view. The property is well maintained and is close to shops and restaurants. Would definitely stay there again! Oceanfront low lower level condo unit. It was a gorgeous view and the unit is perfect for one or two people. They even provided some starter coffee packets, soap, dish soap, dish washer soap, and laundry soap to get you started. The location is convenient to everywhere on the island. Would stay again!